Spurred by its recent record $25 million funding from Blue Sky Venture Capital, Australia’s maverick online wine retailer Vinomofo expanded to Singapore earlier this month, offering consumers access to great wines at wholesale prices. Founded in 2011 by Andre Eikmeier and Justin Dry, Vinomofo took Australia and New Zealand by storm offering a carefully-curated selection of wines from around the world at unbeatable prices when it first launched in those countries. In its first expansion to Asia Vinomofo has launched its Singapore site earlier this month, and looks to overhaul Singapore’s wine retail scene by giving Singaporeans access to wines at prices easier to swallow. One reason why Vinomofo can offer better prices is because it sells by lots of twelve bottles, hence allowing wholesale prices not normally accessed by the general consumer. But the key difference between Vinomofo and other online wine retail sites in Singapore is that while the latter are usually direct offerings from importers and distributors who have to manage pricing as they supply the on-premise and other off-premise channels, while Vinomofo doesn’t have any of that to worry about. Vinomofo also totally bypasses local distribution networks by going straight to the wineries, cutting out the middlemen and the margins that would have entailed. In fact by working directly with wineries – and with its current 500,000-strong community – Vinomofo actually gets access to wines that aren’t available via the usual channels; you’ll even find some wines that are specifically white-labeled for the online wine retailer, or collaboration wines such as the Fanny Limehead Riesling 2016 by Clare Valley’s Penna Lane Wines or the Old Money Cabernet Sauvignon 2014 made by Jim Brand Wines of Coonawara. It’s certainly a far cry from Vinomofo’s earlier days, when it mainly dealt with distressed stock. “Today we’re even offering wines from quality producers in Bourgogne, Bordeaux and Piemonte, as we’ve found that a significant number in our community are willing to pay for more premium wines,” co-founder Andre Eikmeier shared (pictured above left, with fellow co-founder Justin Dry). 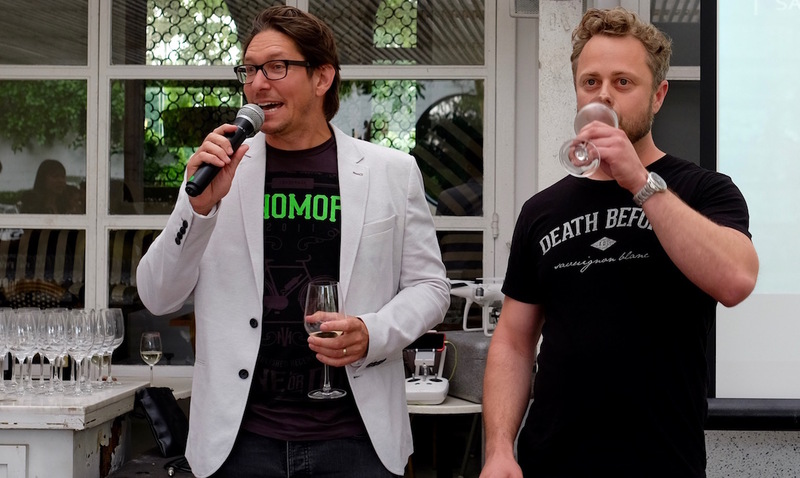 “We’ve been blown away by the impact Vinomofo has had on wine lovers in Australia and New Zealand over the last five years, and we’re so excited to be launching in Singapore, our first step into Asia as part of our global expansion,” he added. One of the best ways to enjoy Vinomofo is via their mixed case deals; or if you like surprises, their black market offers which sends you a mystery case of wine at incredible prices. Vinomofo currently offers a range of around 40 wines from Australia, France, Italy, Spain, New Zealand and Argentina with red, white and sparkling varieties to choose from, with prices starting from $20.